Be a part of making our shelter rooms warm and welcoming for the women, men and children that come to us seeking safety. Families often times come to us with nothing but the clothes they are wearing. When they finally are able to enter their room, we want them to feel welcomed and cared for. Because of you, we can have a few special items in the room (blankets, area rugs, throw pillows) that they may take with them after their shelter stay. By sponsoring a room for the year, you/your business or group, will be listed on our website, be recognized in our newsletters, be invited to a special thank you event and receive a shout-out on social media. We will also post a small plaque of recognition near the shelter room you have adopted. Donate a $1200 for the year and we will purchase the needed items for the room. The funds will allow for us to purchase bedding, supplies, new furniture as needed. (optional, but a suggested special touch, write a few “welcome notes” for us to leave for new clients as they arrive. We will put together a welcome basket on your behalf with your note). 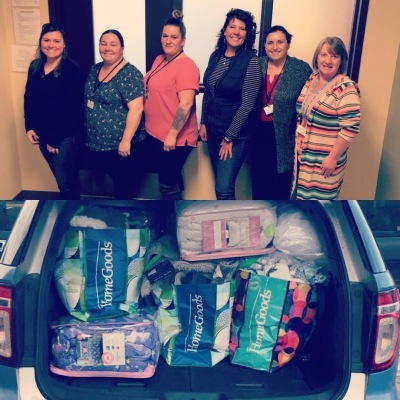 Purchase: 4 twin sheet/bedding sets, 4 full sheet/bedding sets, 8 new pillows, 4 areas rugs (under 3 x 5), 8 throw pillows and blankets, supplies for welcome baskets (soaps, floss, toothbrushes, feminine products, razors, etc). Our staff will assemble welcome baskets for your adopted room. You may provide handwritten notes for our baskets. Contact tpointedirector@qwestoffice.net for more information.